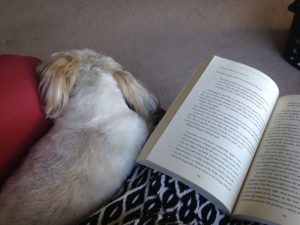 I felt two little paws on my knee, and looked up from my book to see what Beau, our almost three-year-old Shih Tzu, wanted. He didn’t have a toy in his mouth, like he usually does, pestering me to play. I didn’t have any food, so I knew he wasn’t hankering for a handout. Round brown eyes beseeching me, he waited patiently. I finally realized that all he wanted was for me to pick him up. I bent over to comply with his silent request. He held perfectly still as I lifted him up and placed him beside me on the comfortable swivel chair. He nestled in next to me, bedding down with a contented sigh. We remained like that, side by side, for nearly an hour. He can be absolutely insistent when initiating a game of tug-of-war. He’s a shameless beggar at the table. Active and feisty, he loves to play “hard to get” when I try to corral him. But on this day he was just happy to be near me in that cushioned chair. I gave up trying to read my book, distracted by thoughts of how like him I am. I typically go to God when I want something from Him. When He invites me to come and “sit a spell,” I am sometimes skittish. It can be a struggle to set aside my plans and desires just to BE with Him, with no other agenda but to enjoy Him. I was touched when Beau came to me, just to be with me. I enjoyed the warmth of his little body next to mine. I savored those moments together, snuggled close. I honestly didn’t want them to end. I wondered if the Lord feels this way when we come to Him, just to be with Him. When we seek intimacy with Him, He draws near, pulling us close. How it must bring Him pleasure when we linger in His presence, content just to be near Him. And how greatly we need the peace that comes from time spent with Him. We leave changed, more sure of His presence and secure in His love. We experience a deep and abiding joy that comes when God draws near. We can cultivate an awareness of His presence throughout the day, pausing to whisper a prayer, keeping a song of praise in our hearts, telling others of His goodness. He’s always with us. Let’s bring Him joy as we celebrate His nearness today. Lord, we draw near to You today. Thank You for Your promise that when we do, You draw near to us. May we linger in Your presence, and remain aware of Your closeness throughout this day. May we invite others to experience the reality of Your promise and enter into the joy of Your presence. There truly is nothing better than to be near You. Thank You, Jesus, for making this possible. In Your Name we pray, Amen.